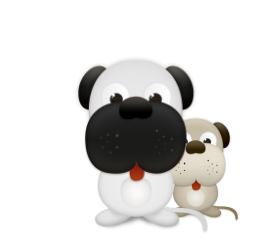 Urgent Appeal, Dog rescue and re homing in Sussex, Surrey, Cambridgshire, Bedfordshire, Huntingdonshire - www.desperategreekiesdogrescue.com, Dog rescue. 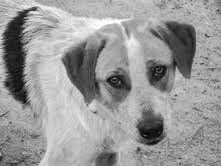 The shelter is at crisis point, food is a huge issue everyday, please help us send money for food to feed the dogs/cats by donating/fundraising. Every penny raised is spent on the animals. Herman and Hettie both need homes. 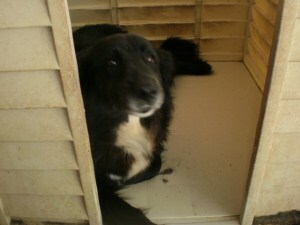 ​Hettie is around 7 years old also and a Labrador type girl, the sweetest girl. ​These 2 dogs were found two plus months ago dumped, skin and bone and suffering terribly from mange and starvation. Freezing cold on the street with no coat or fat to help protect them from the winter. Both in appalling condition. There coats are now recovering and they look much better but the sadness has not left there eyes as they looked longingly at us, they broke our hearts and we must try to find them happiness. ​At present they are both in the vets for a further month having treatment. Herman and Hettie are wonderful, gentle dogs, each desperate for well, simply, love.... a kind word, some home comforts, to be safe and warm and wanted.. 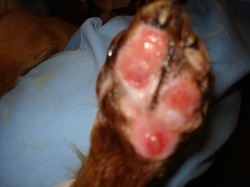 They are currently in a vets receiving treatment but have nowhere to go afterwards. ​There future without help is a barren concrete pen they will never leave. Could you open your heart to one or both of these desperate dogs. 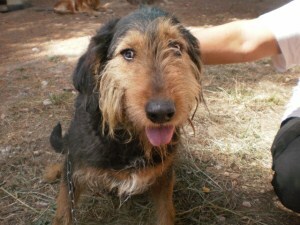 Please dont forget them, they need help..
We have just had a home offer for Hettie!! a lady who already adopted dogs from us has very kindly offered to love Hettie forever. Please let's find love for Herman too. Herman has a home offer!!!! Both currently receiving treatment in a vet clinic these gorgeous lucky dogs now have a happy life ahead. Herman and Hettie now both in happy forever homes and both improving everyday. Nikki, a sweet, terrified puppy 9 months of age was found by a boy by the side of the road, she had been deliberately dragged by a car and left for dead, the rope still around her neck! Nicki had also had a thick wire tied so tightly around one of her front paws it had cut into her flesh and caused her paw to swell. This was another deliberate act to cause suffering. Why? ... To kill her! Her crime?... To be born! The boy took her to a vet clinic where she fought for her life. He told how he had found another dog too but that the poor animal was already dead. 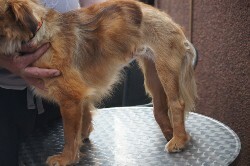 After 2 months of care thankfully gorgeous Nikki is recovering from her horrific ordeal. 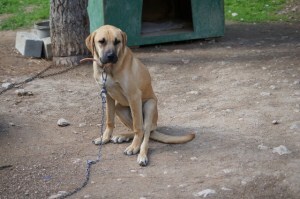 ​We are trying to help her, with so many animals abandoned there is no future for Nikki in Greece. She is microchipped, spayed and vaccinated, we can't bear for her to go back on the streets when healed so we desperately need a foster home or permanent home for this beautiful girl so she can travel to the UK where she will only ever know kindness and love. Video and pictures below are not graphic, they show how she is becoming more confident and trusting and show her wounds healing well, she cant stay in the vets much longer, she needs help to flourish now! Update: Nikki is now in a foster home in the UK and is making huge progress, its great to see her happy. Could you give her a forever home? 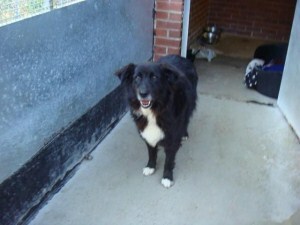 ​Nikki now has her own forever home at last. he was hit by a car and left unable to walk in the road. 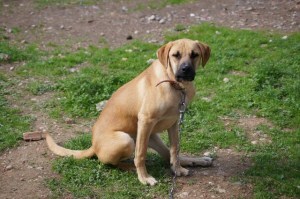 Gus is around 11 months old, so friendly and in desperate need of help. He was lucky to have been helped from the road but unfortunately the vets were unable to repair his damaged elbow, he needs specialist care for this. 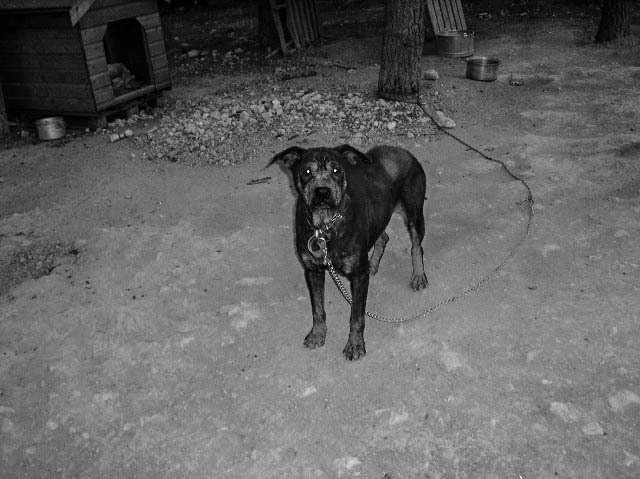 Poor Gus is now chained in a basement for the time being and his future is unknown, it is likely he will have his leg amputated and returned to the streets to survive as best he can as a stray!. He has no owner to pay for X rays or possible surgery..
no owner, no money to help him, no future, only the life of a stray! we are trying to help him, we paid for X rays, we are waiting to find out if surgery is possible to save his leg. Gus had the surgery needed and was confined to a small space, very sadly latest X-rays are disappointing! the healing is not good and Gus appears to be in a great deal of pain. After studying the X rays it has been decided the only course of action to help Gus is to remove his leg, this has now been done and he is recovering at the vets, he will be totally pain free and we are eagerly looking for a loving home for him so he can at last enjoy his life on three good legs. look at his pictures now his leg is all healed. Details on our homing page. Aliki is one of the sweetest dogs I have ever met, my attention was drawn to her after she was shot in the face as she gave birth!!! A callous individual shot and killed her friend and left her to die a slow painful death! her puppies all perished. 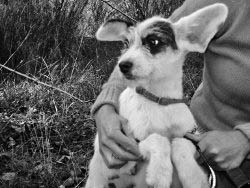 Aliki was very lucky to be rescued, she again was very lucky to receive treatment by another group in Athens, she had 2 big surgeries to reconstruct her face, she had also been blinded in one eye. Many weeks passed and her battered face was healing beautifully. It is in fact amazing! 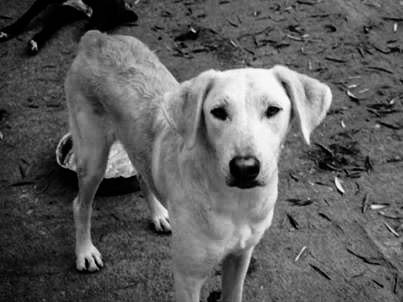 This lovely dog had done nothing but simply try to survive after being discarded on a rubbish dump. The 'person' responsible for this cruelty simply just walked away..
We took over Aliki's care and eventually brought her to the UK where she is very happy now, she has just had a third and we hope final surgery. ﻿Asteris is a lovely boy, about 2 years old, he is quite shy and is looking for a forever home that will give him lots of TLC and time to allow his confidence to build. 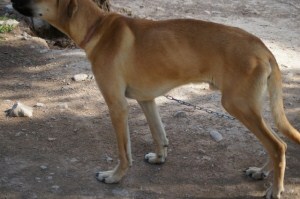 He was born with the two bones in his front leg growing at different rates causing his leg to bow. 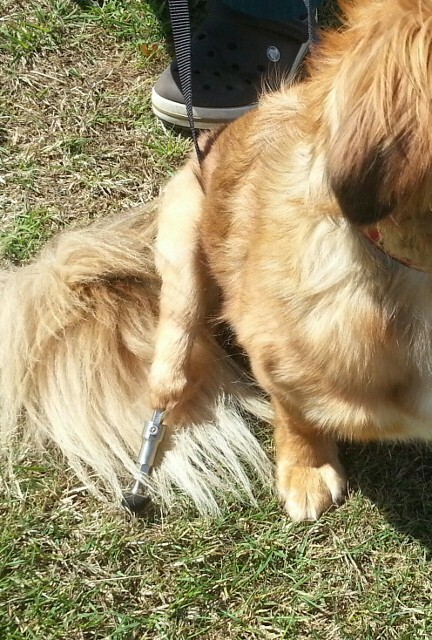 His other front leg had a problem with the elbow. This must have been so hard for him everyday, we found him just struggling to survive, barely able to walk, bewildered and confused. Asteris is now in a loving home. ﻿Just rescued, emaciated, neglected and abused, this sweet friendly little boy needs urgent help to allow us to get him to safety and supply the veterinary treatment that he desperately needs. Bobby has been to the vets and been assessed, he has been cleaned up and made more comfortable, he needs medicines and eye treatments. We are also trying to pay for Bobby to be in a foster home with good food. 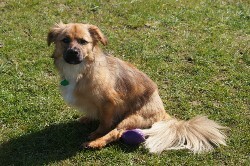 Bobby has been offered a forever home. Bobby is now fully recovered and is in a super home, enjoying himself to the max everyday, no more sad days for this boy. Fox was found paralysed in the road in Oct 2012 after being hit by a car, his back legs had been badly damaged, he was very lucky to be alive, the next car would surely have killed him, he was rescued but unfortunately he was then placed in a cage for the next 5 months with no treatment!!!! (the person had no money) this brave little 7 kilo fella suffered in silence, he gradually regained some movement in his back legs, after some weeks he was allowed to move around outside during the day sometimes, he was dragging one back leg and damaged the top of his paw very badly. 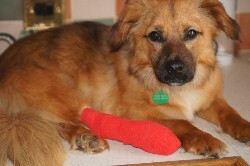 His broken bones gradually healed badly, leaving him in permanent pain. Fox got very lucky when he was discovered living like this and was pass ported and moved as soon as was possible to the UK in March 2013. He was given veterinary attention immediately, after x rays he was found to have a broken hip and a break further down the same leg!! 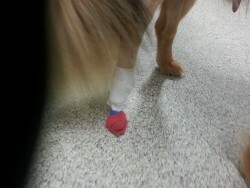 His other back leg was also dead from the ankle down due to irreparable nerve damage!!! Hence he dragged his foot. Fox's femoral head had to be removed, the break further down the same leg had healed not too badly as the other bone had acted like a splint, it was decided to leave this alone, so when Fox had recovered from this surgery we started taking him swimming to help build his muscles and strength. The problem still remained in his other leg that was dead from the ankle down, he has to have it bandaged every day to keep it dry and clean, and this also allows him to play and enjoy himself a little, the wounds from dragging it are healing well although he does have pressure sores from where he runs around. 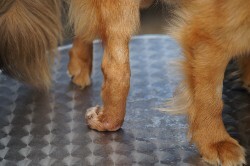 The plan was to amputate this leg when the other is strong enough but it is now felt that Fox could run into trouble if his leg is amputated because he has no femoral head on the other leg, it may not support him long term, this could result in him having to be put to sleep!!! the only option after seeking expert advice and consultation is a Prosthetic limb, we feel because this wonderful brave little dog has suffered so much we have to do this for him, we will not risk him having to be put to sleep, so he will have the surgery in around 4 weeks (mid June) at Noel Fitzpatrick Referral’s in Guildford, please google this amazing place and watch the video of bumblebee the Bassett hound who has one of these marvellous limbs. 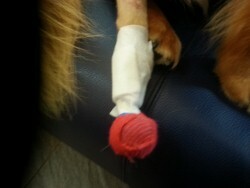 Watch this space for update..
Poor Fox paw so badly damaged where he was allowed to drag it in Greece.. He was in a lot of pain from his broken hip. 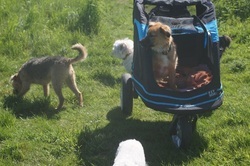 This is Fox's buggy, this was bought for him by two wonderful people Maria and Tony. This allows him to go for walks, he has some fun in the fields and then has a ride. Fox hip has been operated on, his femoral head has been removed, it was smashed by the car. Note the other back leg is paralysed. The other leg is paralysed from the ankle down, as you can see when he is held up his paw does not sit on the ground as it should, he has no control over it, it must be bandaged daily to protect it. This is the leg from the ankle down that will have the prosthetic limb. The surgery went very well, the healing process is underway. Fox still has bandages but you can already see what a huge difference his implant has made, he can stand normally and no huge bandaged paralysed leg to drag around, the pictures below show this, cant wait to see him without the bandages on 16th July when he comes home. Fox is home 3/8/13, nearly 8 weeks in hospital, his implant is perfect! we must be careful for some weeks until the bone grows over the implant inside his leg and then Fox can do whatever he likes! a natural airtight seal between his stump and the implant ensures no infection can occur. 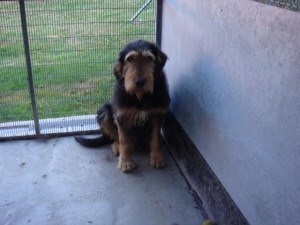 Alf is a lovely young dog, maybe around 1 year old, he has Gt. Dane in him somewhere we feel, he was found wandering in the cold in January 2012. Alf as he is now known was cold, wet and bewildered, he was holding one of his back legs in an abnormal way, limping and sometimes walking on three legs. How this injury occurred we don't know, as he was approached he cowered and wet himself! he was terrified! Alf was reassured and taken to the shelter where he was chained to a tree, given food and water, a kennel, a pat on the head and left to get used to his surroundings, this is the most that could be offered to him. 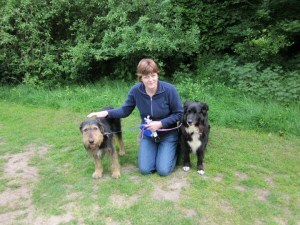 FANTASTIC NEWS, BEAR AND OTTO HAVE NOW FOUND THERE FOREVER HOME TOGETHER. These are two beautiful dogs who are in urgent need of help. 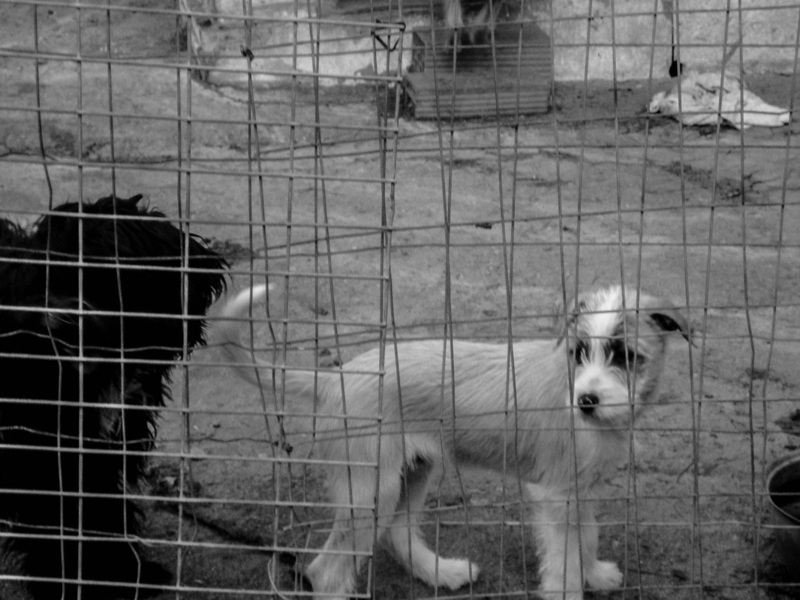 These two poor dogs are terribly bullied by the other dogs and NEVER get to leave the pen they are kept in. There is no space to move them and both dogs end up curled up at the back of the pen in fear. Otto now has badly infected ears and is suffering more than ever. They are so unhappy, every day is a misery for them and we are their only hope of escape. We are trying to raise funds to bring these two lovely dogs over to the UK where we can find them forever homes. We have managed to secure their travel to the UK but do not have the funds to pay for their quarantine. Please help Otto & Bear have a better life. We urgently need funds to help them, please donate if you can, every penny helps. Update: Otto & Bear are now safely in the UK, they have finished quarantine and are in foster at present. They are doing really well and adjusting beautifully. These 2 sweet, friendly dogs had never known love or comfort or a walk or even had the opportunity to smell the grass, there whole lives spent in a concrete pen being bullied!!!! 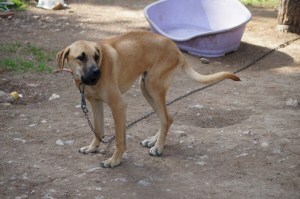 They are fully vaccinated and are neutered. Otto has had his ears treated.